If there is one brand which is going to capture your attention, it is Omorovicza, or Oh - more - o - veet - za as the kind lady at the Liberty counter taught me how to say. Inspired by tradition, guided by nature and spearheading the concept of Mineral Cosmetology, the Omorovicza skincare range has a rich, romantic heritage. It was founded by a young couple, Stephen and Margaret de Heinrich de Omorovicza, who met in Budapest. The unique Hungarian thermal waters are the foundation of Omorovicza's innovative skincare range. 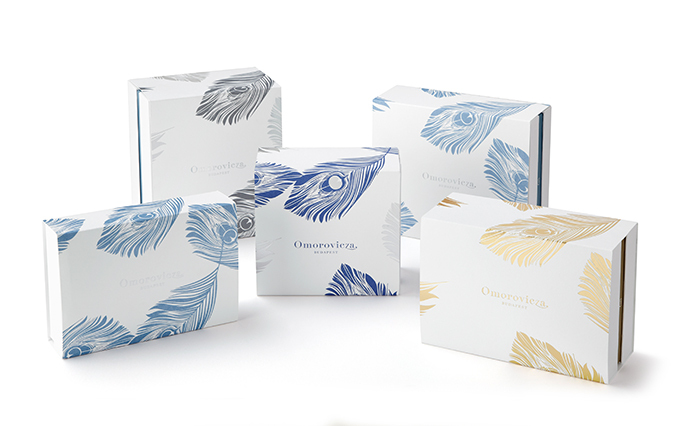 This coming holiday seasion, Omorovicza are to launch a collection of gift sets which are just stunningly packaged. The intricate design of each set was inspired by the peacock feather, a decorative motif often used in Art Nouveau architecture in Budapest. Each gift set includes a selection of bestselling Omorovicza products, ensuring everyone’s skincare needs are catered for. The perfect Omorovicza starter kit for skincare on-the go. This introductory set contains five bestselling products handpicked for their cleansing, hydrating, energising and anti-ageing properties. Each product works in conjunction with the others, to reveal your skin’s true beauty. Includes the Queen of Hungary Mist (30ml,) Thermal Cleansing Balm (15ml,) Cleansing Foam (30ml), Balancing Moisturiser (30ml) and Ultramoor Mud Mask (15ml). The Blue Diamond Collection was designed to awaken and revitalise senescent skin, and to illuminate from within. This opulent set contains the Blue Diamond’s Collection’s favourite products: the Blue Diamond Super Cream (50ml) and the Blue Diamond Concentrate (30ml). Silky smooth yet deceptively powerful, this duo will transform the appearance of your skin within minutes. Cleanse, purify and detoxify the skin with a selection of products from our iconic Moor Mud Collection. Harnessing the power of Hungarian Moor mud, the Thermal Cleansing Balm (50ml), Deep Cleansing Mask (15ml) and Refining Facial Polisher (30ml) leave the complexion cleaner, brighter and younger looking. This set also includes a Mini Mitt to enhance the experience. This spoiling set comprises a trio of sweet-smelling products to tone, refresh, hydrate and nourish the skin: the Queen of Hungary Mist (30ml), the Illuminating Moisturiser (30ml) and the Miracle Facial Oil (30ml). The Omorovicza Gold Collection showcases the anti-inflammatory properties of colloidal gold to help repair and strengthen the skin. The Gold Facial Set includes the Gold Rescue Cream (50ml), a natural barrier cream; the Gold Night Drops (30ml), a night serum to resurface wrinkles, and the Gold Eye Lift (15ml), to rejuvenate the eye contour. I am blown away by how beautiful these kits are and I am impressed that there is something for everyone's budget and that each set will give you a great insight into an amazing brand, or if you are an Omorovicza fan already, a complete pampering treat! These look so beautiful and the products sound amazing, I would love to receive one of them this Christmas. I have not come across this range before but it looks great and I love the packaging too. Great products. I am loving this gift sets. They would make fab Christmas presents. I really like the design of the packaging of these products, tasteful and not overtly feminine. They would definitely make nice presents. I must admit I haven't seen this brand before but the gift sets look amazing and would make great presents. All of these look really good but currently the mud set appeals to me the most! Oh wow, I'm smitten with the packaging. The blue and white patterned set is gorgeous. I've never heard of the brand before, but everything looks so good! Looks great, I'll have to try this! Love the introductory set, never heard of Omorovicza but love browsing the Liberty counters! Ooh I havent heard of this brand before but they look like they'd make great presents!! The packaging is incredible, I would love to receive one of these as a Christmas gift.